Posted: 4月 1st, 2013 under News. TILGFF celebrates its 22nd anniversary this year. 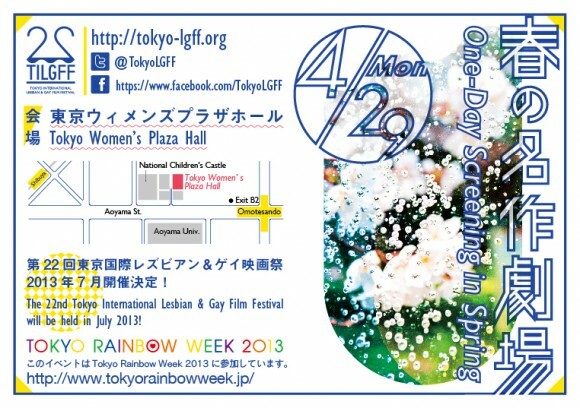 Ahead of the festival in July, there will be “TILGFF One-Day Screening in Spring” during Tokyo Rainbow Week 2013. Come and join us on this special occasion! Timothy’s lush musical daydreams are an escape from his miserable high school life. But his fantasies leap to new heights when he’s cast as Puck in the school production of A Midsummer Night’s Dream and discovers the famous purple pansy love potion. Timothy sees his chance to reshape the world, and make the school rugby jock fall in love with him. Shakespeare becomes a little Shakesqueer when Timothy ensnares everyone around him in musical comedy and errors. With a pop-rock and Broadway soundtrack, and a first-rate cast, Were the World Mine is based on the award-winning short film Faeries by SPEAKproductions. All her life, Chely Wright hid and suffered. Then she bravely shared her story with us. Feature-length documentary Wish Me Away is a personal and intimate look at Chely Wright, the first country music star to come out as gay. After a lifetime of hiding, she shatters cultural and religious stereotypes within Nashville, her conservative heartland family, and most importantly, herself. Over a three-year period, award-winning filmmakers Bobbie Birleffi and Beverly Kopf followed Chely’s struggle? some of which was recorded on private video diaries? and her unfolding plan to come out publicly. Finally, the film chronicles the aftermath of that decision in Nashville, her hometown and within the LGBT community. A school boy confesses his romantic feeling for another boy to a highschool teacher, who is a gay. Wishing upon the final stage in his school, a boy tries coming out to his mother. A life story of a director’s grandmother. The film has been screened about 50 film festivals all over the world and awarded 25 prizes. Park on Sun, April 28.